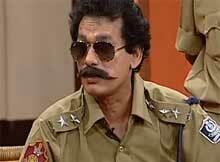 Papu Pom Pom as Police Inspector in Ding Dung Excuse Me episode 13 video watch online here from Tarang TV channel. Shakti Baral called police to his house. A thief has taken one pressure cooker and hot-case from his house. Papu came to his house with constable Rajib and another assistant. He charged family members and servant as culprits one by one. At last, Papu fined them Rs 10,000. Watch Papu comedy from Tarang TV Ding Dung Excuse Me program here. Sir,mu kichi comedy leakhi deabaku chaunchi.